Apple sues smartphone maker company - HTC alleging 20 different patent infringements related to the iPhone's user interface, architecture and hardware. The violated patents include touch and gesture features, finger-swipe unlocking mechanisms, power conservation, touch-screen scrolling and accelerometer capabilities. According to the Apple CEO Steve Jobs, the Company is not going to sit and watch how the competitors steal their patented inventions. Competition is healthy until competitors create their own products. With this purpose Apple submitted the complaints to the US International Trade Commission and the US District Court in Delaware. 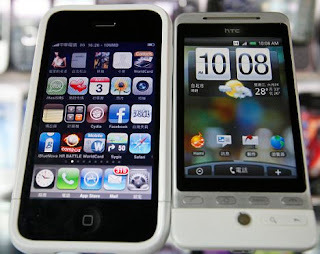 The list of complaints includes such handsets as the Nexus One, Touch Pro, Touch Diamond, Touch Pro2, Tilt II, Pure, Imagio, Dream / G1, myTouch 3G, Hero, HD2, and Droid Eris. Apple sued Nokia for similar reasons. All that leaves us wondering what are eventually the genuine purposes of Apple . But it seems like the company is definitely going through without compromises.